Seller: Micro Integration Services, Inc.
© Micro Integration Services, Inc.
Way out of date. Spend your ninety nine cents at a local brewery not in the app. I travel a lot, and love to be able to find craft beer with this app. Keep up the great work! I don’t leave home without this app. Small database and judging from reviews (most 4-8 yrs old) it’s not used much anymore so database isn’t growing. In cities that I know well am amazed at how little it has. Uninstalling. I love this app! This app gets better with each version! We use it on every trip! 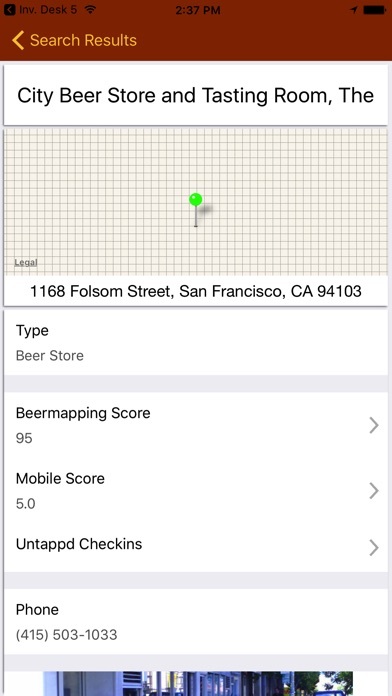 You only need this APP when it comes to finding great beer wherever you are. This APP saves the days all the time when a cold great one is needed. Cannot imagine life without it! I use it all the time when traveling. Please update it! Nice update to the app. Adding a locator button to the map view would help with GPS functionality. Love this app for that. Travel lots and it works everywhere so far in US. I travel a lot for a living and I'm a self proclaimed beer snob. I hate being in a city I'm unfamiliar with and taking a potluck chance at getting a good craft beer. I use this app almost immediately after I check into a hotel to find the best watering hole near me. Cheers! Just needs a serious update for some bugs. Could also use an update on newer beer establishments in areas (that don't even appear on the apps lists), that have been around for at least a year. Nice idea, but months behind the curve in listing Brew Pubs. Great app and easy to use. Whether traveling or at home it's nice to find places I haven't been to yet. Great descriptions of locations and love being able to filter to just pubs and breweries! I like the app but it has so many places that serve craft beers missing. I was at a Plaza yesterday where I knew a minimum of 3 locations that have craft beers. I looked on the app & only one is mentioned. Version 3.5.3 crashes EVERY time. At least it's consistent. It does a good job finding near by brew pubs, but my version say location unknown when I enter town or cities. I can look forward on my trip. Very pleased; have used others of the same genre and Find A Beer is far superior in functionality, performance and features. It does need to accumulate more reviews but that will occur as the numbers of users increases. I'll do my share! This App is indispensable if you travel in the US and like craft beer. Found several beer bars in Houston, (my home town) I did not know about. Looked up seveal brew pubs I know of in Oregon and they are on spot with descriptions, directions and reviews. Cost is less that a glass of beer and the App will direct you good beer bars, brew pubs where you can get good craft beer. It functions as describes. As a frequent traveler I am able to find a good watering hole and something to eat. This app was great when it came out but it hasn't been updated in over three years, so the data is extremely weak. I just tried to write a review. I spent some time on it and realized when I was done that keyboard covered up the save button and I was not able to submit my review. Please fix this. Can't create a profile. Can't login. Can't add a location. Can't fix it. I have been using this app for years to find nearby brewpubs on my travels. It is quick and has a complete directory listing. I have tried other apps, and this one works better and has excellent data. Must have app for beer aficionados. This is my go to app for years. I got everything setup and I just push the button and my options pop up. My favorite App that has been used in many cities! Just bought it and like what I see. But how come no ability to create a user profile? Can't find my city and then locks up into search mode so I can't back out and try different search parameters. Very useful app when traveling to new places. Not very accurate but still useful. I was surprised when some of the better and closer Tap Houses didn't show up on the list. Months later, still not there. I went through the process of gathering the information, website, and submitting it a while back. Still not on the map. If you're traveling this could be handy. If you are using the app to try all the local locations it seems to be lacking in accuracy. I've used this app from Alaska to San Diego and I love it! Always gives me good info. One down side I did notice is that if there are no places close by, it tends to crash. Not frequently though, so still 5 stars! Occasionally buggy, but fantastic overall. Great if you travel often for work/leisure. Good ratings and reliable info on breweries. I travel a lot and I have come to depend on this app to steer me to good brew. I use the 'current location' selection and always get good advise. Whenever I travel I am constantly checking it to see if there is someplace to get a beer! It does not always list every place, but I have always liked the places it has listed! Want quality beer? Find it here. I travel all over the world and am constantly looking for a craft beer at the end of a long day. There's an app for that! 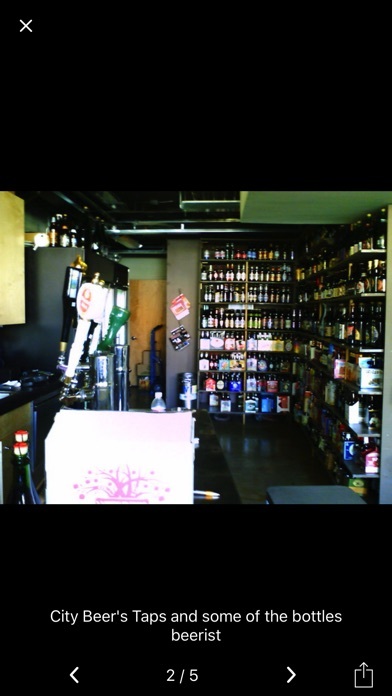 I have located breweries, tasting rooms, ale houses and retailers via this app that I never would have found on my own. Having them rated and vetted by beer knurds is priceless. The reviews are pretty accurate (subject to personal tastes), and very helpful when multiple choices abound. To the reviewer who dinged this app for not listing every bar on the street he was walking down - you missed the point! Find Craft Beer will NOT list every lame American Swill watering hole in town. It would be worthless if it did! Makes beer hunting trips much easier, allowing more fulfilling adventures. This is a must for any beer geek. I've found this app to be far superior to web searching when I'm on the road looking for a new brewpub to try. Highly recommended. Any where u are u can find the closest craft beer. I use this app to find good beer every time I travel. Great little app for the beer officionado. I would like to be able to see more brew stops when zooming out, but it's useful when looking in your immediate area. When it works its pretty nice. Problem is it crashes almost every time I search by current location. My favorite app. Easy to use and a great user community. Prost! Used to be a great app but it appears it is no longer being updated. Notice the dates on the good reviews. I just downloaded this and tried a few different cities. There are many (all the good breweries) missing from the list. This is helpful in finding beer in places you are new to. Have used this app to find good local beers when traveling. Very good resource for road warriors who enjoy local fare versus the cookie cutter franchise bar and grill. I travel for a living - and I love beer! This app has allowed me to discover great beer in places I didn't know existed. It's so nice to know that just beyond that chain-style bar I used to settle for is a wonderful local bar with craft beer on tap. Particularly when on foot. Great app! Did not serve purpose. Want money back. I only use this app for craft/micro beer purposes. Mainly brewpub finding, plus breweries. The theory behind the app is awesome but the programmers can't seem to figure out how to make it happen. I have had this app for over a year now but when it crashes, it rains and pours until they temporarily fix it again. Can't search by zip code or many cities that it doesn't recognize in it's small list. Please fix this guys!! Thus was the best App I have ever paid for. Always on target! I highly recommend this App for the beer lover in us all!! Database has not been updated in forever. Using the latest version on iOS 7, and can't get past the initial search screen. Guaranteed complete crash with every attempt. Disappointed. Great for finding nearby beer! This is the first app I open when I land. Breweries typically have the best food so my wife and I are both happy. Keep it up! Great for the traveler. Helps avoid getting stuck with Bud Lite. This app seems to have a pretty extensive listing and it's nice to have two kinds of reviews, plus access to untappd and other ratings sites. A couple things missing though: A way to bookmark a place I want to try. All they have is "flag" which is if there is a problem. Ability to find beer along a route, for road trips. 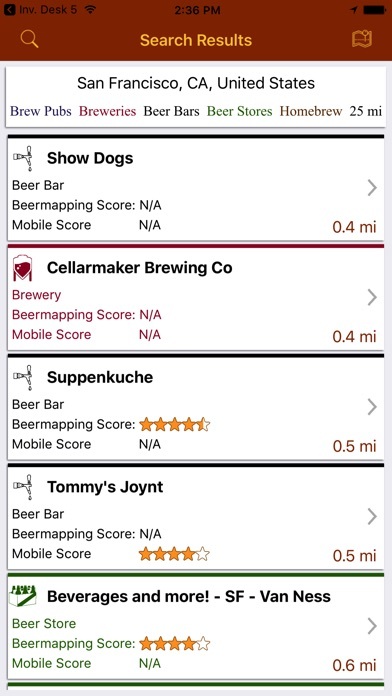 Another app (beer mapping?) does this but doesn't have the reviews. EDIT 11/1/16 : app has fallen out of date along with the beer mapping website linked with it. Still works mostly but has lost some features and lots of links are broken or wrong. 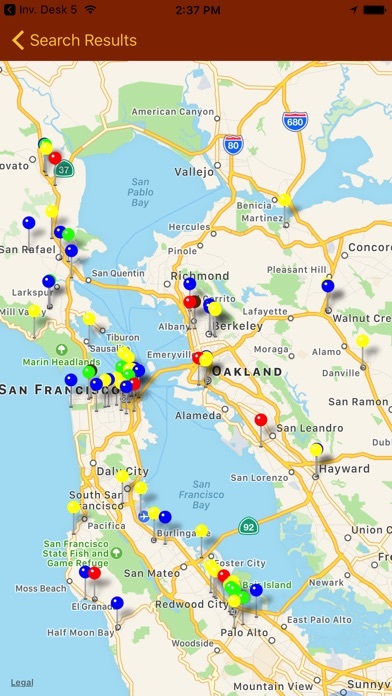 This app has helped me find stores, pubs, and breweries I never knew existed in my area. I collect growlers and love trying new beers and use this app every time I go out of town to find everything from a good six-pack to a brewery tour. As a growler collector, I would like to see a new tab under the location info letting you know more info as in: on on/off abc licence. I've used this app ever since it was first released and it hasn't failed me yet. And I travel a LOT. I can find craft beer where ever I go, or plan to go! Fantastic app! One of the most awesome apps out there, if you're a craft beer fan this is a must have app! Completely worthless, doesn't tell you anything. So mad I spent money on this. Think a 5 year old is the developer. Great tool to find great beer! Thank you for all the great new beers and to all those who take time to post reviews of the establishments the app helps them find! 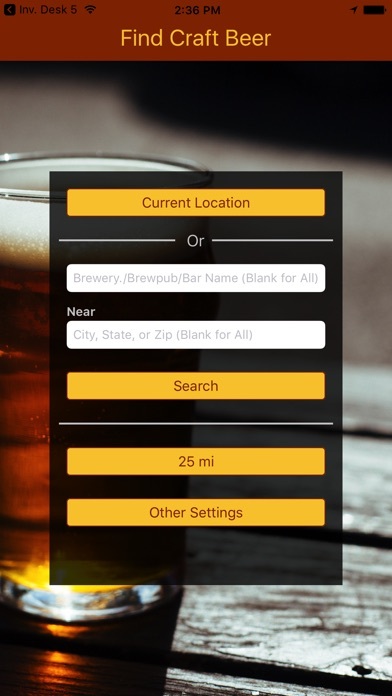 If you enjoy craft beer and travel, then you must have this app. I have visited 670 beer making site and in the last year this app has contributed to my count. While I use the beer mapping site directly when a computer is available, while on the go this app is invaluable. Many times I have found an unexpected site when consulting the app. Whenever in a brewery or brewpub, I show this app to others and normally they acquire the app on the spot. The ability to send updates and additions immediately are most helpful to the craft beer community. Thanks for one of my most used apps. We use this to find local beer places wherever we travel. Although the first line is the standard start for a review, it also has the strength of being true! Where ever I travel, the first thing I do is check the surrounding area for beer using this app. Another trick I do is when I visit a place, I check to see if the app knows where I am. It hasn't failed yet! This app helps me find good, non corporate, brews Many good. Some, not so much. But Always an adventure. I’ve used this app for years now and it is wonderful! I’ve found it’s sometimes a good idea to put the address in google maps-especially in Europe-it doesn’t always have the correct place in the maps app.